End Of Retail ? Not! Hey, there’s something you should know about the end of retail: It’s not really the end of retail.Last week, I plugged a report in Bloomberg Businessweek foretelling the future of retail as a wasteland of department and electronics stores. As shoppers did more of their research on the Web, learned about products from friends, scanned their cards (or phones) over machines, and shopped at places like Amazon, I predicted that retail would need fewer workers manning the floor, recommending items, and running the registers.The sudden resignation of Best Buy’s CEO was just the latest chapter in the recent struggles of retailers. Those struggles themselves are only one volume in the 15-year stagnation of retail employment. I stand by the basic thesis of the piece: Technology poses a threat to retail, just as it posed a threat to employment in manufacturing and agriculture, the last two supersectors that got bit by innovation that killed jobs and improved efficiency. But a broader picture suggests that what we’re seeing in retail doesn’t look like the end of anything, really. Here’s a graph that tracks four supersectors’ share of America’s jobs. Retail is in blue. Manufacturing is in red. Health/education is in green. Agriculture is in orange. What do you see? Here’s what I see: Manufacturing’s in a free fall. Even its recent recovery — 400,000 new jobs in two years — has done little more than stabilize the sector around 9%. Agriculture has ducked under 2%. Health/education has doubled to 15%. And retail? Its share of jobs is remarkably thermostatic. Three decades ago, retail was 11% of the economy. Today, it’s … 11% of the economy. When you deal with supersectors, you tend to lump a lot of important small numbers together. “Retail” isn’t one big store. It’s millions of stores in hundreds of categories, from pet food to jewelry to tire dealers. But let’s start to get specific. “Department store employment has declined 15% since 2001, almost on par with new car dealers (-17%) and better than furniture stores (-24%). 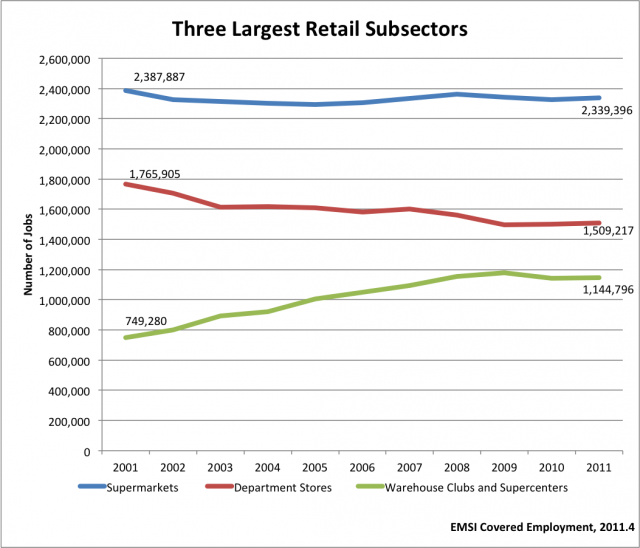 Supermarket jobs have been mostly stagnant. Warehouse clubs, on the other hand, have exploded, growing 53% since 2001. The “end of retail” was never the end of retail, exactly. It was the beginning of the end of retail employment. As frictionless online shopping, mechanized payment processors, and efficient planning replaced the need for more workers, retail’s share of the overall employment would decline. But what these numbers show is that even broadly defined, the end of retail is spiky. Warehouse club employment (where efficiently might actually replace the need for some retail workers!) is up 50% in the last decade. Clothing stores for adults and infants are both up more than 30%. Pet stores are up a third. Home centers (e.g. Lowe’s and Home Depot) are up 28%. Try telling those stores about the end of retail.